Scientists at the University of Michigan’s Comprehensive Cancer Center have uncovered genetic markers in a rare type of breast cancer called phyllodes tumors by wielding a powerful new tool in the molecular diagnostics arsenal: Next-Gen sequencing. While phyllodes tumors represent a small fraction (less than 1%) of breast tumors and are often benign, they are particularly aggressive in the their malignant state. Additionally, there are currently no reliable methods for predicting reoccurrence or malignant transformation after initial treatment. Nor are there many effective treatment options should malignancy occur. Dr. Tomlins and his team obtained 15 samples of phyllodes tumors from the University of Michigan archives. These samples were dived equally in to three categories: benign, borderline, and malignant. Using Next-Gen sequencing, the researchers compared the phyllodes tumors samples against a panel of genes previously shown to have some functional role in other cancers. The research team found two genes among the malignant phyllodes tumor set that were amplified, epidermal growth factor receptor (EGFR) and insulin-like growth factor 1 receptor (IGFR1). Due to their active role in other cancers, EGFR and IGFR1 have been a target for the development of a number of chemotherapeutic agents. The results from this current study would support assessing the currently available drugs in the treatment of phyllodes tumors. In addition to the gene targets uncovered within the malignant tumor group, the investigators found a mutated gene, MED12, which was common in all three tumor sample categories. This gene has been shown previously to have a role in an array of cancer tissue types, but its occurrence in some rare gynecological cancers that are related to phyllodes tumors was of particular interest to Dr. Tomlins team. 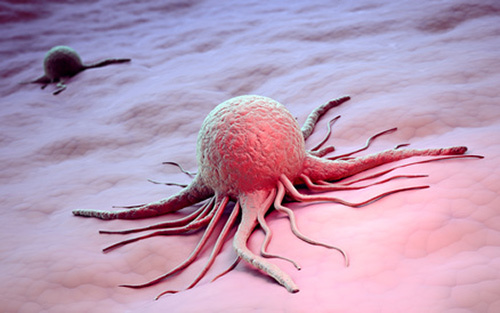 They suspect that MED12 could play a critical role in the tumor initiation step.